We are excited to announce a new addition on the plant floor…the FEELER FV-2214 Double Column Bridge Mill. We wanted to expand our manufacturing abilities and the unsurpassed performance and value of a FEELER machine along with their rigorous quality control made it an easy decision. 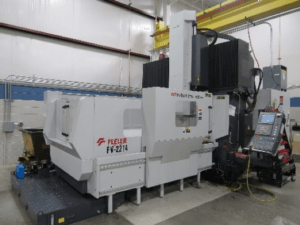 “The main structural component of our FEELER mills are manufactured from heavily ribbed cast iron to ensure excellent finishes in large, complex parts” according to their product manager, Paul Hurtig. With this new bridge mill we can now machine bigger components and larger die-sets in-house versus having them machined on the outside. This gives us better control of the quality and eliminates rework because critical information no longer needs to be communicated back and with forth with an outside machinist.